We’d love your help. Let us know what’s wrong with this preview of Princess by Jane Dismore. To ask other readers questions about Princess, please sign up. I've developed a bit of an interest in Queen Elizabeth II in recent years due to the different films and tv shows revolving around her and the royal family. I was excited to read this book because it focuses on her life before she became queen whereas most of my limited knowledge about her is stuff that has taken place after her coronation. The book also provides some background info about other members of the royal family, including her husband Philip, her uncle who famously abdicated his title I've developed a bit of an interest in Queen Elizabeth II in recent years due to the different films and tv shows revolving around her and the royal family. I was excited to read this book because it focuses on her life before she became queen whereas most of my limited knowledge about her is stuff that has taken place after her coronation. The book also provides some background info about other members of the royal family, including her husband Philip, her uncle who famously abdicated his title, and her mother whose true parentage remains under scrutiny. While I did enjoy reading about Queen Elizabeth's family, I much preferred when the attention was on her. Regardless of your feelings on whether the monarchy should still exist in today's times, you have to admit that being a princess and later queen isn't all sunshine and rainbows. I can't imagine having to live your life under a microscope which she has had to do since birth. It was fascinating to learn some of the little things you take for granted that she is/was unable to do because of her title. I do love though that her parents did try their best to make sure they spent quality time together as a family when they could. Overall, a really interesting look at the Queen's childhood and early years of her marriage before her father died. Thank you to Thistle Publishing who provided an advance reader copy via NetGalley. I have read many books on The Windsors and Queen Elizabeth, so the challenge was to find something fresh and new in a well-trodden subject. Coming to this book presented by a small British publishing house, I wondered how this would measure up against other bestsellers on the topic. To my pleasant surprise, this was a worthwhile read; well-researched and sprinkled with new information. The book begins with the deat Thank you to Thistle Publishing who provided an advance reader copy via NetGalley. The book begins with the death of Princess Elizabeth's father, King George VI, triggering Elizabeth's ascension to the British throne. It then backtracks in time to the marriage of her parents, the birth of Princess Elizabeth and later, her younger sister Princess Margaret. There is much depth to the telling of this history such as deeply fleshing out the family background of Elizabeth's mother, the former Lady Elizabeth Bowes-Lyon. The book covers the princesses' upbringing such as schooling, friends, activities and social interaction, lodgings, etc. It is always very interesting reading about the challenges faced during the war such as air raids, rationing of food, clothing and utilities. The abdication by Elizabeth's Uncle David (King Edward VIII) of course thrust Elizabeth's father into the role of Monarch, where he braved the uncertain times of war and set a good example for his nation. Naturally, the book also covers Philip Mountbatten who married Princess Elizabeth and became Prince Consort. Immediately following each chapter are reference notes to expand on various information in that chapter. The book comes full circle when it ends as it began...with Queen Elizabeth's assumption to the British throne following her father's death. Regardless of your political persuasion or view of a state-funded monarchy, it is hard to disagree that Queen Elizabeth II has occupied the throne of the UK as a highly respected, hard-working monarch, that is totally committed to her role. This book written by Jane Dismore looks at Princess Elizabeth and her life prior to her coronation as Queen in 1953. Jane Dismore seems to have access to biographical accounts and information that enable this version of Elizabeth's life to be told with a sense of honesty, accuracy and authenticity. It is a story that is told from a much more personal and maybe human perspective. It deals with an Elizabeth that is much more carefree not having the obvious burden of Head of State to deal with. The story runs from Elizabeth's birth to the eve of the royal wedding on 2 June 1953. The book covers her childhood, playing with her relations and her interactions with the King and Queen. It is interesting to see the relationship develop between Elizabeth and Philip and while the story deals with facts and true accounts it is told in a wonderful story-like fashion. I would highly recommend this book not only as a biographical account of the early years of Queen Elizabeth II but as an engrossing story. I am by no means a royalist but I appreciate that they do make money as well as spend it! The number of tourists coming to the UK to visit Buckingham palace and other Royal residences has grown exponentially in the past few years and is set to grow even more with the addition of Meghan Markle, the Duchess of Sussex. I must admit I did watch the Royal wedding and was surprised to see a number of black performers including the cellist, Sheku Kanneh-Mason, the Kingdom Choir led by Karen Gibson, and I am by no means a royalist but I appreciate that they do make money as well as spend it! The number of tourists coming to the UK to visit Buckingham palace and other Royal residences has grown exponentially in the past few years and is set to grow even more with the addition of Meghan Markle, the Duchess of Sussex. I must admit I did watch the Royal wedding and was surprised to see a number of black performers including the cellist, Sheku Kanneh-Mason, the Kingdom Choir led by Karen Gibson, and that unforgettable sermon from Bishop Michael Curry. All of these performances were electrifying and beautiful, in my opinion. It it is long overdue that someone like Markle has finally made their way inside the historically white modern British monarchy. Very few people actually realise that this is not the first time a person of different ethnic origins has married into the British Royal Family, that distinction actually goes way back to the 18th century to Queen Charlotte of Mecklenburg-Strelitz, Queen Victoria's grandmother. Charlotte was the wife of King George III, who was Queen from 1761 until her death in 1818, and was of mixed race. Apparently she was "directly descended from Margarita de Castro y Sousa, a black branch of the Portuguese Royal House." I picked this up mainly because I love history and being British, I feel I should know more about my country. It comes across as well-researched and was an easy and enjoyable canter through Queen Elizabeth II journey including meeting and falling in love with Prince Phillip of Greece as well as other important happenings from the early part of her life. All in all, this is a thorough and detailed account of Queen Elizabeth's formative years and what set her on the road to becoming Queen. Interesting and packed with meticulous research, you could do worse than investing some time reading this. Dismore has done an exquisite job! Princess Elizabeth is probably the best-loved and most admired woman in the world. After her marriage to Prince Philip, she blossomed into one of the world’s great beauties while at the same time was raising a young family. Her world seemed perfect “as a normal naval wife”. “Changes were coming that would lay the foundations of the future.” The book by Jane Dismore focuses on the Queen’s early life pre-coronation, and it is a unique royal biography which tells the story of a Princess who became Q Princess Elizabeth is probably the best-loved and most admired woman in the world. After her marriage to Prince Philip, she blossomed into one of the world’s great beauties while at the same time was raising a young family. Her world seemed perfect “as a normal naval wife”. “Changes were coming that would lay the foundations of the future.” The book by Jane Dismore focuses on the Queen’s early life pre-coronation, and it is a unique royal biography which tells the story of a Princess who became Queen. It tells a story of a woman who found herself through adversity, a story that illustrates a woman before she matured into the most recognisable and authoritative female figures in the world. The eternal problem facing royal writers is that of authenticity. How to convince the world of the truth or your account and the veracity of your sources. This account of Princess Elizabeth’s life is that it is independent of control and many of the Queen’s family, friends and councillors for the first time speak with honesty and frankness despite the fact it meant putting aside the ingrained habits of discretion and loyalty that proximity to royalty invariably engenders. Princess: The Early life of Queen Elizabeth II is just what the title claims. It is based on facts which are published and narrates an engrossing story which I highly recommend reading. This review could also be found here! Unless you’re new here, then you’ll know that I have a thing for royalty. This isn’t the first biography I’ve read about the Queen and it certainly won’t be the last. I’m no beginner with things, so I felt like this book was a huge repeat for me. It’s definitely a good book for those who want to start learning about the royal family and have no idea where they ought to start. The only shame about this boo This review could also be found here! The only shame about this book, and the reason why I rated it three stars, is because it doesn’t really focus on the subject very well. The book is, apparently, about the Queen’s life before she became queen (so, from birth to 1952), but it also wasn’t. Most of the book really focused on her parents and uncle. There was a whole chapter spent on her mother’s birthplace and how no one’s really sure where she was born. It was a completely pointless chapter to keep in. Then, there was random paths down her mother’s familial history. A lot of time was also spent on her Uncle David. The world knows him as Edward VIII or the Duke of Windsor. Aka, the only reason she’s currently queen. While it was a needed chapter because this directly impacted her life for better or worse, it also didn’t focus on her. It was more about people’s reactions to his abdication, not how she felt or reacted to it. And that made it pointless as well. Even as she grew older, I never felt the book was actually about her. When the bombings started in England, it was more about what other people said about it. I don’t think I ever really learned more about her war participation and I wanted to. Then, it focused on Philip and his girlfriends. Like, why? I don’t care about that. If I wanted to read about him, I would have picked up a biography about him. She marries him, of course, but his life circumstances didn’t impact her until their marriage. Each little bit of the later chapters talked about him, which I didn’t like. Do you see what I mean? The book is more about things that went on around her than actually about her and what she did. To me, that’s such a shame. Queen Elizabeth is such a fascinating woman who has had an extraordinary life. A new biography of Queen Elizabeth II, focusing on her early life, with new research and insights. As a 13-year-old girl, Princess Elizabeth fell in love with Prince Philip of Greece, an ambitious naval cadet, and they married when she was 21. When Elizabeth suddenly became Queen at 25, their lives changed forever. With previously unpublished material and unique interview I received a DIGITAL Advance Reader Copy of this book from #NetGalley in exchange for an honest review. As a 13-year-old girl, Princess Elizabeth fell in love with Prince Philip of Greece, an ambitious naval cadet, and they married when she was 21. When Elizabeth suddenly became Queen at 25, their lives changed forever. With previously unpublished material and unique interviews with friends and relations, this book looks afresh at her life as princess, glittering yet isolating. Letters from Elizabeth and the royal family give an intimate insight into their lives and minds. Vivid detail and anecdotes reveal more about her, the era in which she grew up and the people who shaped her life. The love and stability her parents provided, and the presence of her mother’s family, Bowes Lyon, with their creativity and eccentricities, gave her a solid background from which to draw during the rapidly changing times of her long reign. This book tells the story of a young princess becoming a Queen. I think that I have read almost every biography of ERII*** and this one was an enjoyable read. Did I learn something new? Not really --- a few tidbits here and there but nonetheless this is an excellent bio of a fascinating woman. We do at least one biography a year in my book club (I* actually belong to 8 clubs) so I am going to nominate this title as it was very enjoyable. On February 6, 1952, at age 25, Princess Elizabeth became Queen Elizabeth II. At the time, she was married to Philip and the mother of 2 children. Her father, George VI, died when he was thought to be recovering from lung surgery. As Elizabeth and Philip were on tour at the time of the King’s death, many plans were set in place for her return to England and her succession to the Crown. This book is broken up into spans of years. It delves into some early history of the Royal Family which I found On February 6, 1952, at age 25, Princess Elizabeth became Queen Elizabeth II. At the time, she was married to Philip and the mother of 2 children. Her father, George VI, died when he was thought to be recovering from lung surgery. As Elizabeth and Philip were on tour at the time of the King’s death, many plans were set in place for her return to England and her succession to the Crown. This book is broken up into spans of years. It delves into some early history of the Royal Family which I found fascinating. We learn about each of the family members and some history about each of them. The book also goes into how World War II affected the people of England and how strong even the royals had to be. There are snippets about the nannies of Elizabeth and her sister, Margaret and the differences in the girls’ personalities. I have read numerous biographies of Queen Elizabeth II and other members of the Royal Family and I was delighted to learn many new facts. I was also impressed with how well the author wrote the story in that she did not show any bias when writing about the family members. That has always been a pet peeve of mine when reading other biographies. Too many authors let their bias shine through loud and clear. So, I congratulate Jane Dismore on her fair account. I highly recommend this book and I know readers will love it. If you are a Royalist like me, this will be a book you won’t want to put down. As a lover of all things royal, this was a wonderful read! Queen Elizabeth has always been a favorite royal. She has served with a dignity that at times just doesn't seem real. This book gives us a great look into her childhood and the coming of age of a young woman in love. It shares with us the mantle of royalty for a young woman who's family didn't want the crown. This is a great book. I haven't read anything from this author, I would welcome any further reads written by her. Princess by Jane Dismore is an excellent Biography of Queen Elizabeth II. The minute historical details woven into Elizabeth‘s story of her early life. The influences of the Royal Family, friends, World War II, England and her faith. The reader has the feeling of being there and watching it all happen. I thank the author, publisher and netgalley for allowing me privilege to read and enjoy this book. Thank you NetGally.com and Jane Dismore for the opportunity to read this fabulous story of the Queen. I have read numerous books on the Royal Family and this is by far a favorite. I love the very detailed moments and the intimate portrait of the young princess. Five Stars! The most notable book I have read about the queen to this point was Sally Bedell Smith's, "Elizabeth the Queen" and I count Princess: The Early Life of Queen Elizabeth II, by Jane Dismore as another exquisitely researched work and highly enjoyable read. With her reign as Queen just shy of 67 years, more and more we are seeing movies and TV shows bring the Queen's life to screen - with the Netflix series, "The Crown Thank you to Thistle Publishing who provided an advance reader copy via NetGalley. With her reign as Queen just shy of 67 years, more and more we are seeing movies and TV shows bring the Queen's life to screen - with the Netflix series, "The Crown" being the most recent. I am a huge fan of the show and so when I saw this book was available, I jumped at the chance to read it. It did not disappoint and in fact increased my interest even more into this fascinating and barrier breaking Queen. Carefully researched and more set in context and well rounded than previous royal biographies, Dismore sets the childhood of Elizabeth II in the drastic social changes of post WWI Britain and demonstrates the effects of the abdication on her path from country house gentry to the throne, as well as the heavy weight of WWII. I was intrigued as soon as I saw this book on NetGalley because I don't know anything about Queen Elizabeth before she became queen (I didn't even know how she looked like when she was young!). So when I heard that this book also contained unpublished material from letters and interviews, I decided to request for it. Princess is a sensitively written account of Queen Elizabeth's early life. It starts off with the moment she became queen (very sadly, she was one of the last people to know) and the I was intrigued as soon as I saw this book on NetGalley because I don't know anything about Queen Elizabeth before she became queen (I didn't even know how she looked like when she was young!). So when I heard that this book also contained unpublished material from letters and interviews, I decided to request for it. Princess is a sensitively written account of Queen Elizabeth's early life. It starts off with the moment she became queen (very sadly, she was one of the last people to know) and then backtracks to when she was born before going forward from there. It covers her childhood, marriage, and life as a newlywed. I was actually pretty surprised at how normally her parents raised her. You always hear of extravagant lifestyles but it seems like Queen Elizabeth and her sister were raised to be as down to earth as possible. Part of it may have been the times where they grew up, but it seems like a part of it is also due to her parents and their personality. I felt that they had a very genuine and loving relationship, which was very touching. Also touching was her relationship with Prince Phillip. Because she eventually marries him, the book does touch on key moments of his life before they met. There isn't anything scandalous in their love story, but it's a very sweet account. The one thing that surprised me while reading was the Duke and Duchess of Windsor. I didn't really have any views about them because I knew nothing about them except that the King abdicated to marry Wallis Simpson, so it was a shock to find out that both of them had pro-Nazi views. I’m definitely going to side-eye anyone who praises Wallis Simpson now. Overall, this was an interesting and informative account of Queen Elizabeth’s early life. The only thing I wish it added were photos of key moments - while they are probably just one google search away, it would be nice to be able to flip to them in the book. Hopefully it’s just my advance copy that doesn’t have pictures because I think it would add a lot to have them. I've always been enamoured by the Royal Family, but since the release of The Crown, I've been consumed by everything royal! Many nights after watching an episode (or three) of the Crown, I'd dive into a Google search and end up reading endless information about Queen Elizabeth & the Royal Family. This recent interest in the Royal Family was one of the reasons I was so excited to read "Princess." Much of what I had read focused on Elizabeth's life since becoming Queen, or her marriage and earl I've always been enamoured by the Royal Family, but since the release of The Crown, I've been consumed by everything royal! Many nights after watching an episode (or three) of the Crown, I'd dive into a Google search and end up reading endless information about Queen Elizabeth & the Royal Family. This recent interest in the Royal Family was one of the reasons I was so excited to read "Princess." Much of what I had read focused on Elizabeth's life since becoming Queen, or her marriage and early adulthood, but few books walked through her life as Princess - and what that meant for her. I loved Jane Dismore's detail and historical accuracy in depicting Elizabeth's life and her family history. It was fascinating! The way she painted the picture of this Princess transitioning into Heir Presumptive (and, as the reader knows, though not discussed, Queen) portrayed a perspective that isn't commonly seen or even thought of! Jane Dismore's research is as meticulous as her writing form is engaging, and it is this balance of talents that makes Princess such a good read. What with Harry and Megan's recent wedding this topic is very much aucourant, and though I haven't watched any of these made-for-TV British royalty series straight through, from what glimpses I've seen I don't think they convey a sense of how much work and grit being royalty requires. Dismore does manage to do this. My only complaint is the abrupt endi Jane Dismore's research is as meticulous as her writing form is engaging, and it is this balance of talents that makes Princess such a good read. What with Harry and Megan's recent wedding this topic is very much aucourant, and though I haven't watched any of these made-for-TV British royalty series straight through, from what glimpses I've seen I don't think they convey a sense of how much work and grit being royalty requires. Dismore does manage to do this. My only complaint is the abrupt ending, as I wanted to keep on reading through to present day! Queen Elizabeth II is the longest-reigning monarch in the world. Queen Elizabeth became the Queen at the age of 25 years old, she's in the public eye since she was 25 but how much do we really know her? While a very public figure, she is also a private person as well. Her younger years have always fascinated me but also her relationship with her husband Prince Phillip. This was a well written book about the young princess Elizabe Thanks to the author, publisher and NetGalley for the review copy. Queen Elizabeth II is the longest-reigning monarch in the world. Queen Elizabeth became the Queen at the age of 25 years old, she's in the public eye since she was 25 but how much do we really know her? While a very public figure, she is also a private person as well. Her younger years have always fascinated me but also her relationship with her husband Prince Phillip. This was a well written book about the young princess Elizabeth who as a 13-year-old girl, fell in love with Prince Philip of Greece, an ambitious naval cadet, and they married when she was 21. With previously unpublished material and unique interviews with friends and relations, this book looks afresh at her life as princess, glittering yet isolating. Letters from Elizabeth and the royal family give an intimate insight into their lives and minds. Thank you Thistle Publishing and Netgalley for this lovely book. I've read this book with pleasure. Being a fan of series about historical figures, I obviously loved The Crown but it was interesting to have background information presented in a very readable book. It could have done with pictures, I think, but on the other hand it provided enough links to look them up myself. Since I'm no expert I cannot say how well the book was researched but the end product is informative and entertaining. This book offered a rare glimpse of Queen Elizabeth's life from birth to right after her marriage to Prince Philip. I am a huge fan of the show The Crown and love that this book offered a lot more information on Elizabeth's life before she became Queen. The author did a great job covering this period of her life and of describing the various events and people that influenced Elizabeth. Anyone that enjoys reading about the Royal Family will love this book! Princess: The Early of Queen Elizabeth II gives a reader an interesting look into the life of Queen Elizabeth II. I thought it was fascinating to see how she grew up and getting a glimpse of her personality. It is easy to read and not overwhelming with information. I give it 4 1/2 stars. I read the Kindle edition. Absolutely brilliant! This book gives the history of Queen Elizabeth II from before her birth with the history of both of her sets of grandparents, their lives, their homes and their demeanor. It was truly fascinating. We move along to the birth of Princess Elizabeth and her early childhood precociousness and her playful and yet serious personality. She was always very correct, learning to bow and curtsey and address her elders with respect. The public I read the Kindle edition. Absolutely brilliant! This book gives the history of Queen Elizabeth II from before her birth with the history of both of her sets of grandparents, their lives, their homes and their demeanor. It was truly fascinating. We move along to the birth of Princess Elizabeth and her early childhood precociousness and her playful and yet serious personality. She was always very correct, learning to bow and curtsey and address her elders with respect. The public loved her from the start and craved seeing her. Although shown to the public rarely, they were apparently special times for those who caught a glimpse of the princess. This book goes into detail about WWII and what the princesses were doing at that time. They volunteered and assisted with making the military men more comfortable. Both of the girls, Elizabeth and her younger sister Margaret, were welcoming and friendly. The men were grateful for their company. The nights of terror in London during the bombings and the actual missile strikes against Westminster were detailed. As she moves into adulthood, she falls for Philip Mountbatten at an early age. They get wed when she is twenty-one. They believe they have several years of togetherness before she has to assume the throne. They have two children, Charles and Anne. Suddenly, she is queen at age twenty-five following the sudden death of her father “Bertie” who is King George VI. Elizabeth and Philip’s lives are changed forever. This book is well written in clear and concise English. On occasion, this reader got a little confused at the numerous names of relatives and others who surrounded Elizabeth. I felt at times that I needed a chart. There is some going back and forth between timelines as well. The footnotes at the end of each chapter were very helpful. It was so nice not to have to flip back and forth throughout the whole book to find the quote that the footnote cited. While most of my English history is based in the Tudor time period, I absolutely fell in love with Elizabeth and her family. The book covers Elizabeth’s early life to the time of her assuming the throne. She is such a refreshing person. I highly recommend this book to anyone who is interested in the history of Great Britain, or just loves a good biography. I do so hope that Ms. Dismore goes on with her biography of Queen Elizabeth II. Attention all Anglophiles! You will love this historically sound life of Princess Elizabeth from her birth until she becomes Queen. The author has thoroughly researched her story and many sources are included in this book. The Princess had a quiet and sheltered early life, as much as possible in the royal world. Parts of her childhood were spent at the various palaces and royal homes, but she enjoyed a warm family life. I liked that the first Buckingham Palace Guide Company with twenty Guides an Attention all Anglophiles! You will love this historically sound life of Princess Elizabeth from her birth until she becomes Queen. The author has thoroughly researched her story and many sources are included in this book. The Princess had a quiet and sheltered early life, as much as possible in the royal world. Parts of her childhood were spent at the various palaces and royal homes, but she enjoyed a warm family life. I liked that the first Buckingham Palace Guide Company with twenty Guides and its Brownies pack of fourteen was formed for Elizabeth and her sister Margaret. When she was ten years old, her father became King after the Abdication of his brother, and Elizabeth became the Heiress Presumptive and the most famous child in the world. World War II was a dark and frightful time for the UK and Elizabeth and her family did their part to encourage the country. Elizabeth’s cultural programme continued and she carried out more wartime duties. The wedding of Princess Elizabeth and Prince Philip was marvelous to read about. Readers will be touched by the loving letter from her father the King. The book shares Elizabeth and Philip’s early married life. After attending a play, Princess Elizabeth and Prince Philip dined at London’s fashionable Café de Paris, where they were joined by the stars of the production, Laurence Olivier and Vivien Leigh. The book ends with the death of her father the King and the start of her outstanding reign as Queen. Elizabeth continues to be a remarkable and admirable person. This book is written in a factual way that is very positive about the Princess and the Royal Family. As an American, all the different dukes and duchess and viscounts and family members were hard to keep track of but many readers may enjoy learning about this. I recommend this positive and informative book. Thank you to the publisher and to Net Galley for this advance reading copy. My review opinions are my own. I loved this exemplary well researched account of the early years of Queen Elizabeth to when she became Queen. The author has listed sources here for the reader that is interested in reading further about her life. This is a wonderful journey for the reader of all things royal. For the worlds greatest leader had a fascinating story to her upbringing that is detailed here. The book begins with her birth and ends with the death of her Father. The book documents how the Princess had a sheltered early life spent at the palaces and royal homes, with servants, horses and activities most can only dream of. Her family life was very loving and close among the most glamorous and wealthy upbringing. She had a close relationship with her Father who became King after the abdication of his brother. Elizabeth then became the most famous child in the world at only 10 years old and she seemed to grasp the enormity of her future. From that moment her history changed and she was destined to become Queen. The information here on WWII and Elizabeth's role is fascinating. The author has so well documented that time in history and the suffering of Britain that its very moving. I thank the author for bringing this critical time in her history to the reader in such a real way that is almost overwhelming in events as they unfolded. The book shares Elizabeth and Philip’s early married life and their courting love story. It ends with the death of her beloved Father. Her reign as Queen is for another book . One that I hope the author will write! This is a fascinating well researched enjoyable read about a remarkable Queen admired by the world . It is a enjoyable look back at a quite remarkable early life that helped create the leader she has been for over 50 years. Her standards , moral fiber and her strength is much gained from her early family life and the love of her family . I loved every aspect of this book and highly recommend it for all interested in royal history and the Queen. Much has been written about Britain’s current queen, Elizabeth II. However, in the biography Princess, it tells the story of Elizabeth’s life before she became a queen. Queen Elizabeth was never meant to be a queen. Her father was the second son of George VI. It seemed as if her uncle Edward would marry and sire heirs. When he shocked the world by abdicating the throne for the woman he loved, Elizabeth suddenly found herself the center of attention as the heir presumptive. Elizabeth finds hersel Much has been written about Britain’s current queen, Elizabeth II. However, in the biography Princess, it tells the story of Elizabeth’s life before she became a queen. Queen Elizabeth was never meant to be a queen. Her father was the second son of George VI. It seemed as if her uncle Edward would marry and sire heirs. When he shocked the world by abdicating the throne for the woman he loved, Elizabeth suddenly found herself the center of attention as the heir presumptive. Elizabeth finds herself with responsibilities that she does not initially want. Princess paints Elizabeth to be reluctant to become the next queen of England. The biographer states that she would rather remain a country girl at heart. However, Elizabeth took her role as heir seriously. She is prepared to attend ceremonies and make speeches. Elizabeth is also portrayed as a no-nonsense woman and very protective of her sister, Margaret. I also found the relationship between Elizabeth and Prince Philip to be very fascinating. Elizabeth claims that Philip has been her rock throughout her life. This biography shows how supportive and steadfast Philip is to Elizabeth. Princess also emphasizes that he was a bit of prankster. This gives us a different glimpse of Philip whom most people view as stiff and rigid. Overall, Princess paints a very compelling portrait of the early years of Queen Elizabeth II. There were times when the biography diverted from the subject and went on tangents on other people such as Prince Philip’s girlfriends. Sometimes, Princess took the gossip and tabloid route. For instance, it heavily focused on the Queen Mother being the daughter of a cook that was proposed in Lady Colin Campbell’s biography. It is obvious that the biographer believes in Lady Colin’s gossip. Therefore, I found this part of the Queen Mother’s past to be very irrelant and did not serve any purpose in Queen Elizabeth’s biography. Still, Princess is a very enlightening read for those who want to know more about the queen’s childhood. A fascinating biography! The book begins with the death of her father and then reverts to the story of her parents’ courtship and marriage. It explains why the royal family, especially the Queen Mother, disliked the Duke of Windsor and blamed him for the early death of King George VI. Elizabeth was born to the line of royal succession but no one expected her to become Queen. She was raised to be a royal princess but most people expected her uncle, the Prince of Wales, to marry and have his own ch A fascinating biography! The book begins with the death of her father and then reverts to the story of her parents’ courtship and marriage. It explains why the royal family, especially the Queen Mother, disliked the Duke of Windsor and blamed him for the early death of King George VI. Elizabeth was born to the line of royal succession but no one expected her to become Queen. She was raised to be a royal princess but most people expected her uncle, the Prince of Wales, to marry and have his own children. However the book details the interest that Queen Mary took in her grand-daughter’s education which makes the reader wonder if the Queen knew her son Edward better than most people and suspected that Elizabeth would one day be Queen. The book details her childhood, the courtship and marriage of Phillip and Elizabeth and her first years of motherhood. It also narrates the difficulties that she faced as a wife whose husband was deployed, as a mother whose children were not allowed to travel with her, and as a daughter who frequently had to represent her father in affairs of state. The book is well written and concise but does contain enough details and footnotes to keep the reader interested. I do hope that Jane Dismore is already writing the next volume because she only covers the first 25 years of Elizabeth II’s life. Many thanks to NetGalley and Thistle Publishing for sending me the ARC of this exceptional biography. Thank you Thistle Publishing and David Haviland for this kindle advanced copy of Princess: The Early Life of Queen Elizabeth II by Jane Dismore. This book will be released on July 5th 2018. This is the story of Queen Elizabeth from before her birth to right around when Princess Anne was born. I was amazed by this book, so many things as you would expect with a lot of years of someone's life. This book is packed with births, marriages, death, history, love, and the life of the rich. What I didn't Thank you Thistle Publishing and David Haviland for this kindle advanced copy of Princess: The Early Life of Queen Elizabeth II by Jane Dismore. This book will be released on July 5th 2018. This is the story of Queen Elizabeth from before her birth to right around when Princess Anne was born. I was amazed by this book, so many things as you would expect with a lot of years of someone's life. This book is packed with births, marriages, death, history, love, and the life of the rich. What I didn't expect is bombs, Hitler, Gloria Vanderbelt, tales of ghosts in the palace. Ms. Dismore did a wonderful job on this historical biography on Queen Elizabeth. You will learn how she grew up, things she went through as the youngest Queen, being bombed by Hitler, meeting Phillip when they were very young, how it blossomed into a love affair and then marriage. It is interesting to know how well behaved and how polite Queen Elizabeth is growing up. Her love for animals and others. She also served in World War II and became Queen at age 10, age 10 that is impressive. I loved the work that went into her wedding dress, such detail that I could bring it up in my mind what it looked like vividly. This book also gives me insight to what was going on around my great grandparents and grandparents early life. Things they knew about that now it's too late to ask. Thanks to Ms. Dismore I have a new insight to those things. Thanks to Thistle Publishing and Mr. Haviland I would have never read a book like this and I sincerely thank you so much. I recommend this book to all my family and friends, it's sure to be a best seller. The cover is beautiful. 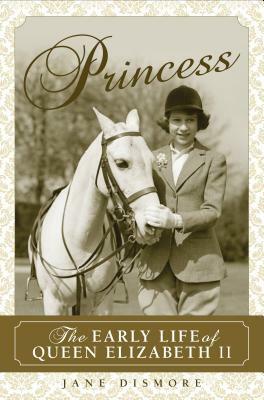 Princess The Early Life of Queen Elizabeth II by Jane Dismore from Thistle Publishing is an interestingly, informative and well written book. Jane Dismore did an excellent job providing an easy fast read that is well researched. She sites books and articles, archives, personal records and interviews. The author provides an interesting look into the history and life of the royal family from King George V and his son King George VI to the 25 year old Princess's unexpected ascention to the thrown. Princess The Early Life of Queen Elizabeth II by Jane Dismore from Thistle Publishing is an interestingly, informative and well written book. Jane Dismore did an excellent job providing an easy fast read that is well researched. She sites books and articles, archives, personal records and interviews. The author provides an interesting look into the history and life of the royal family from King George V and his son King George VI to the 25 year old Princess's unexpected ascention to the thrown. The author also covers the abdication, Wallis and The Duke, and also why the Queen Mum discrepancy regarding the Queen Mum's place of birth may be of interest. This truly enjoyable book is what a biography should be and I highly recommended this to those interested in history, The Royals or just those who have wondered what Prince Phillip wore to bed. Thank you NetGalley, Jane Dismore, Thistle Publishing and David Havilan for a copy of this book. This review is my own opinion and was not required.